Pop Quiz: How Did a $12 Billion Search Engine Sell for $36 Million? After being bought three times in ten years, Lycos is a shadow of its former self. Take our quiz and match the optimistic company statement to the purchase date. 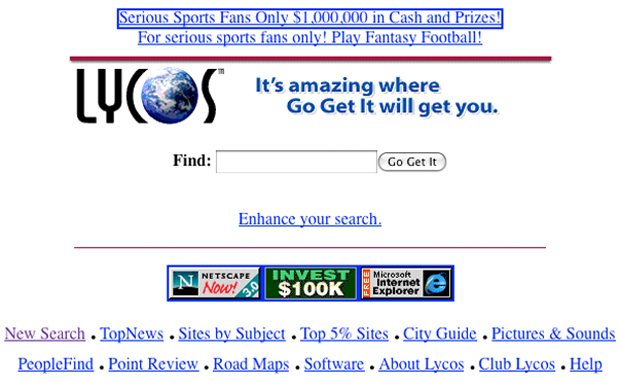 Ten years ago, search-engine portal Lycos sold to Terra Networks for $12.5 billion. Six years ago, Korean Internet firm Daum acquired the company for $95.4 million. And today, Lycos switched hands again, this time to India’s Ybrant Digital–for only $36 million. That’s a 99.712% drop in value in just one decade. The company went from receiving roughly 50 million unique visitors daily to boasting that it reaches about that number in an entire year. By 2007, Lycos’ share of the global search engine market dropped to 0.01%. To put that in perspective, Google Kenya around that time had two-times that market share. Lycos’ only other asset: AngelFire, possibly the world’s worst free web-hosting service. Who in their right mind would want to purchase this company? Here’s a look back at how each of its acquisitions were described by the purchasing company at the time. See if you can guess when each statement was made. a. Terra’s purchase in 2000, when Lycos’ CEO Bob Davis boasted of the transaction. c. Ybrant’s purchase in 2010. From a statement released today by Suresh Reddy, Chairman and CEO of Ybrant Digital. b. Daum’s purchase in 2004. The company’s optimism was on display in this statement. a. Terra’s purchase in 2000. Terra chairman Juan Villalonga felt he could see how the future would play out. b. Daum’s purchase in 2004. Analyst Glen Chapman realized how little the company was worth. a. Terra’s purchase in 2000. An enthusiastic Salon financial analyst was a little off.